Never Forget to Take your Birth Control Pill again with this Ingenious Pill Case! For the pill to be 99 percent effective in preventing pregnancy it needs to be taken right. Never forget to take your "pill" again! Just keep the e-pill Pillpak in your purse. Don't let distractions interfere with your birth control routine. FREE Shipping (US only). All e-pills | Simple e-pill Reminders. My Pillpak is as indispensable as my cell phone K.S. Both fashionable and functional, the Pillpak is a rectangular, hard-sided pill case designed to fit all rectangular birth control packages (blister packs) and tricked out with a handy alarm to remind you when to take your dose. 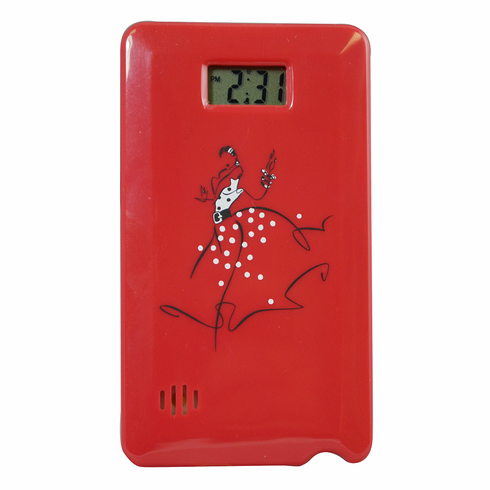 Fashionable Lady In Red design. Reusable month after month, Pillpaks come with alarm and easy-to-follow instructions. The unique design even provides room to discreetly carry additional protection against STDs. Will it fit my pills? (birth control pill). DISCLAIMER: Our pill case, with Alarm Notification, provides no guarantee of birth control. If set properly and kept on one's person, with timely usage, this product may reduce the risk of pregnancy. We are pleased to provide you with the resources on this site for your personal education, but nothing on this site constitutes a recommendation for medical care, nor do we make a warranty of any kind in terms of their appropriateness for individual on-line users. Size: 4 inch x 2 1/4 inch x 5 /8 inch | Weight: 2 Oz.